Last week, we were eyeing a 1989 Delta HF Integrale in Florida (it's still for sale), but this special edition version of Lancia's WRC icon takes the cake. Besides the fact that it's one of a limited run of just 400 examples of the more potent Evoluzione model in Martini livery made to celebrate the Integrale’s fifth consecutive World Rally manufacturers’ championship for Lancia, this specific car has only been driven for 50km or 31 miles since new! And that distance was covered from the supplying dealer to the current owner, who somehow didn't give in to the urge of driving such an iconic sports car and kept it in perfect storage conditions for the past 22 years. Now, the unnamed owner has listed the car for sale at Silverstone Auctions at its Race Retro Sale in Warwickshire on February 21 and 22. 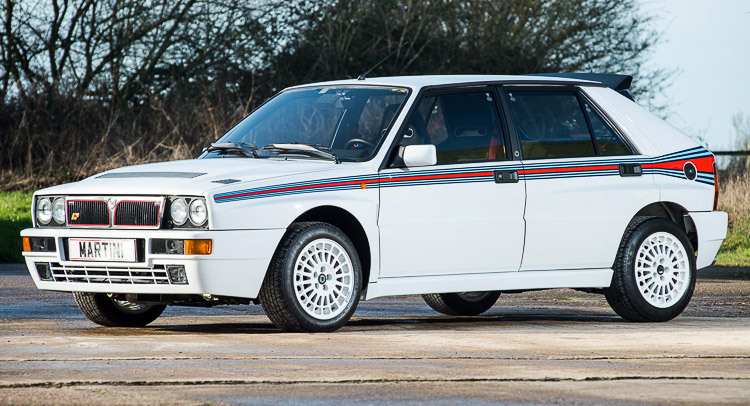 "As a limited edition special, produced to celebrate the Integrale’s success in the World Rally Championship, these cars are incredibly rare indeed," commented Guy Lees-Milne, General Manager, Silverstone Auctions. “So, to find such a perfect example with just a few miles on the clock really is an exceptional feat." As a 1992 model, the special edition Delta HF Integrale was based on the wider (front and rear tracks and corresponding wheel arches) and more powerful Evoluzione or Evo 1 version with the 210PS (207hp) 2.0-liter 16v turbocharged four engine. This car is production number 124 and according to the auction site, it's "currently unregistered and comes complete with its original service book, manual, sales invoice and tool kit", with Silverstone estimating that it will fetch between £90,000 and £110,000 (approx. $136,000 - $167,000 or €121,000 - €148,000). Right after the gallery of the actual car offered for sale, we've added a video of another Delta HF Integrale Martini Edition we found on YouTube.